My sister-in-law has just returned from Ilorin, with three koko pots from the Oja Oba market. 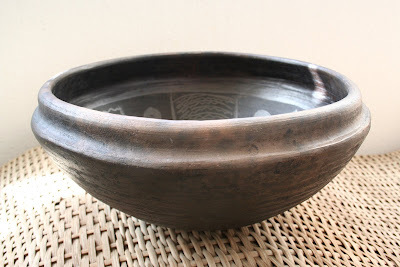 These beautiful dark pots are an Ilorin speciality. The most expensive pot was N200 - a dollar and a half. They would fetch twenty or thirty times that (if not more) in the US or the UK. So often people do not recognise the value in what they have close by. Why is that? The immediate answer is I don't know why exactly. From what I've observed Europeans & Americans, seem to be able to be relatively open-minded and outward looking and are able to spot many things that attract them in other cultures (and don't feel they are belittling themselves by admiring what is not theirs). This ranges from Mathematics from the Middle East, to the Chinese flare for ingenuity, to admiration of the intricacies and harmony of traditional societies eg Papua New Guinea and Aboriginal Australia. This may have something to do with feeling "secure" in their own culture and the appetite for learning and research into all sorts of fields ranging from natural phenomena to the most obscure and intangible thought processes. What's so exciting about that? Show us modern invention, technology, cure for malaria or AIDS, now that's worth boasting about. Santa Fe, New Mexico is famous for its Native American pottery made in the many Indian pueblos in the area. Pots similar to the ones you display would fetch anywhere from $200 to $2000 depending on its maker and the gallery offering it. Showing disdain for aesthetics is just so typically Nija! Must everything be functional and practical? With no beauty around you, its hard to find the beauty of your soul. But to your point, you'll find that those pots are efficient heat conductors and they probably have less carcinogens than your fancy shmantzy copper bottom what-nots. Jeremy, thanks for a good business idea. Why is value only related to money? This example presents no evidence at all that people don't value what they have close by! 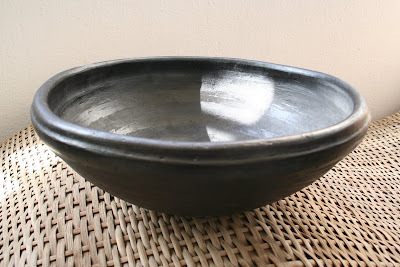 Maybe many of the people buying the pots for a couple of dollars appreciate and value them (aesthetically as well as for their utility), but that is no reason why they should pay ten times the selling price for no reason! I value water, beautiful scenery, my trellis jasmine in flower - all sorts of things I pay little for, if anything at all. if u wanna sell em hit me up!